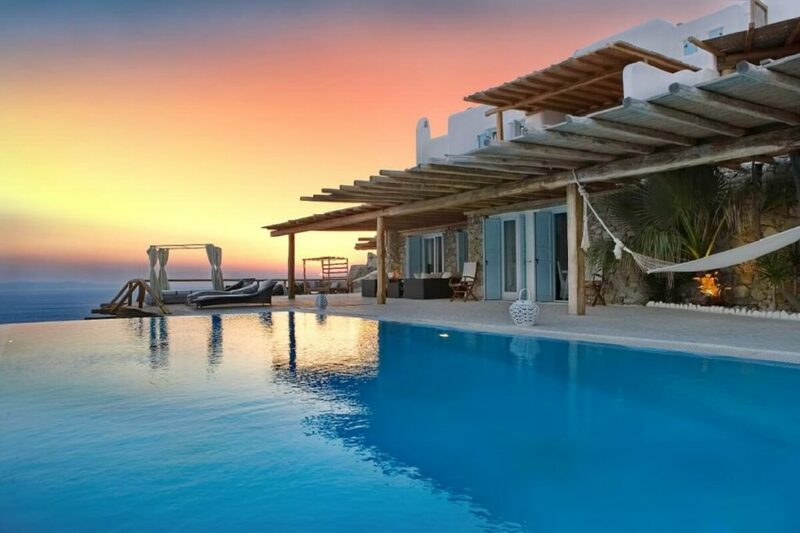 This Villa of 450m2 has 3 levels, 12 bedrooms, a private infinity pool of 70 m2 and amazing outdoor areas offering the guests privacy, luxury and the most unforgettable experience of their holidays on the island of Apollo. Cesar Villa comprises of a double living room area with a unique dining table, a fully equipped kitchen, a comfortable lounge facing the fireplace, 6 king size suite rooms for couples and one bedroom with three single beds, most of them with their own private bathroom. At the first floor we have 5 bedrooms, 3 of them are considered to be Master Bedrooms with private handcrafted bathrooms and 2 double bedrooms with a huge deck in front of the Big Blue with private dining areas and sofas. 2 en-suite double bedrooms with a garden view. On the third floor we find the level of the infinity pool and another deck with a dining table for more than 20 guests, sunbeds and sun lounges, a romantic hammock, the BBQ, and a fully equipped kitchen as well as a bathroom. On the fourth floor we find an interior living room with a fireplace and exterior salon. Heart shaped veranda (sofa & dining area).